Israel’s justified, in fact long delayed, military response to the rocket fire from Gaza triggered debate worldwide. Some criticism was reasonable, anguished, sympathizing with a state’s right to self-defense after eight years of bombardment, no matter how intermittent, while questioning the response’s intensity. Alas, much criticism was – dare we say it – disproportionate, dishonest and frequently discriminatory. Shouting at Jews “go back to your ovens” in Fort Lauderdale, vandalizing synagogues in Chicago, smashing Starbucks Coffee windows in London, lacks any ambiguity. The barrage of criticism launched illustrates how quickly condemnation of Israeli actions degenerates into anti-Zionism, which is often a thin veneer for anti-Semitism. Although calling the response disproportionate implicitly conceded that some response was justified, most critics went further. Critics silent about Muslim murders of fellow Muslims in Gaza, Iraq or Sudan became obsessed with Israel’s “crimes,” no matter how surgical the IDF tried to be. More disturbing, the Mideast conflict’s dysfunctional, polarizing gravitational physics led many who criticized Israel’s actions to idealize Hamas. Demonstrating this dishonesty in prominent essays in The Washington Post, Guardian and The New York Times, respectively, former president Jimmy Carter, Avi Shlaim of Oxford University and Rashid Khalidi of Columbia University all sanitized Hamas to demonize Israel. Carter treated Hamas as a peace-loving movement seeking a “comprehensive cease-fire in both the West Bank and Gaza,” ignoring its charter’s vows to destroy Israel. Khalidi defined Israel’s 2009 war aims by unearthing a 2002 comment from Moshe Ya’alon, chief of General Staff at the time, about trying to crush Palestinians, ignoring many more recent, far uglier, Palestinian calls to annihilate Israel. And in a down-is-up essay, wherein Israel’s painful withdrawal from Gaza became an attempt to expand its territory, Shlaim treated Hamas as a democratic movement even though it seized power in a coup by murdering fellow Palestinians. Shaim wrote of Hamas: “Denied the fruit of its electoral victory and confronted with an unscrupulous adversary, it has resorted to the weapon of the weak – terror.” It is particularly disingenuous for an historian to claim Hamas only “resorted” to terror due to the evil Israelis – as if Hamas had not first used such “weapons of the weak” back in the early 1990s, to sabotage the Oslo peace process. Despicably, others used Holocaust shorthand to berate Israel. Calling Gaza a “big concentration camp,” as Cardinal Renato Martino, the Vatican’s justice and peace minister, did, or writing in on-line in Spain that “the Machiavellian brain of this entire extermination operation is no different from that which designed Nazi Germany,” crossed the line. For starters, the Holocaust – and other genocides – killed thousands, tens of thousands, millions – dwarfing the Palestinian civilian casualties in the hundreds despite three weeks of war. Moreover, there is something particularly dastardly about preying on an ethnic group’s historic sensitivities. President Barack Obama will endure much criticism, but if critics make slavery analogies or refer to minstrel shows, their condemnation will be racist. During her campaign, Hillary Clinton and her supporters did not deem attacks on her Iraq war stance sexist. They complained about excessive attention to her clothes, speculation about her grit and other comments invoking stereotypes which historically demeaned women. MANY OF these anti-Zionist attacks resurrected the historic ghost of anti-Semitic essentialism. When asked about his fellow protester in Florida who shouted at Jews, “You need a big oven, that’s what you need,” one rally organizer initially seemed to disavow the remarks. “She does not represent the opinions of the vast majority of people who were there,” Emmanuel Lopez told Fox News. But Lopez quickly added that “Zionism in general is a barbaric, racist movement that really is the cause of the situation in the entire Middle East.” Lopez, a state coordinator for ANSWER (Act Now to Stop War and End Racism) engaged in classic racist essentialism. For centuries, critics of Jews have degenerated from criticizing specific Jews’ individual actions to generalizing about Jews and Judaism. Generalizing about Zionism’s essence condemns Jewish nationalism with this age-old anti-Semitic tactic. A sign at a Melbourne rally took this rhetoric further, crying: “Clean the Earth from Dirty Zionists.” You do not need a PhD in Jewish history – or in genocide studies – to see the Hitlerian overtones. Many victims of racism – and most especially the Jews in the Holocaust – were tagged as unclean, thus deserving of extermination, lest the general population be infected. The ugly inverted rhetoric follows its inexorable logic: accusing the victims of the 20th-century’s most horrific genocide of committing genocide, then essentializing and demonizing their movement for collective national fulfillment, leads to calls for eradication. (It also excuses Iranian calls for Israel’s genocide). Jews have seen this happen too often to be blasé about it, whether the speaker is a Vatican official or a street punk. Essentialism poisons the environment and corrupts other arenas. In the past 40 years, no Western power has engaged in any major military action that did not trigger massive criticism. However, the broad lynch-mob atmosphere against Israel singularly questions its existence, not just the proportionality of its actions. More than 60 years after the country’s founding, the world still has the Jewish state on probation, seemingly only accepted when it behaves well. Rogue states like Pakistan – an artificial creation carved out of a crumbling British Raj – do not have their existence questioned, while Israel constantly has to justify itself. It is depressing in the 21st century to see such anti-Semitism, especially among those who designate themselves knights in the fight against racism. But the disproportionate demonization, the idealization of Hamas, the essentialism, the animosity coursing through so much criticism of Israeli actions suggests that the world has yet to heal from one of its most persistent afflictions. The writer is professor of history at McGill University in Montreal. The author of Why I Am a Zionist: Israel, Jewish Identity and the Challenges of Today and Leading from the Center: Why Moderates Make the Best Presidents. In October 2000, Hezbollah terrorists using United Nations vehicles kidnapped Benny Avraham and two fellow soldiers. campaign to free their sons, unaware that Hezbollah had already murdered them. In Israel, Haim Avraham became a national icon representing all fathers who have been forced to send their sons to war, never to see them return. When Israel finally confronted Benny’s killers in 2006, Haim, Edna, and their two daughters, Efrat and Dafna, spent the war visiting soldiers. 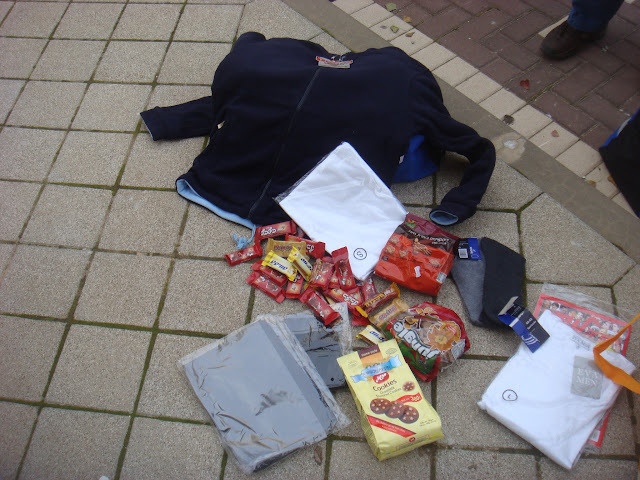 While distributing goodies to thousands, they spread the message that the war was just and necessary. Haim insisted on embracing every soldier, lechazek eem chebuuk, to strengthen with a hug. This January, Haim and his family took to the road again, this time with assists from Montrealers, particularly congregants of Rabbi Chaim Steinmetz of Congregation Tifereth Beth David Jerusalem and Rabbi Adam Scheier of the Shaar Hashomayim Congregation. As soon as they heard that soldiers needed warm socks, long johns and fleecies, they joined others in Israel and the Diaspora and sprang into action. Thanks to their generosity, Haim, his daughter, Dafna, Haim’s colleague, Yoram, and I visited the Gaza front to spread his message with love, idealism and treats. Haim told the soldiers that his family had sacrificed repeatedly to build Israel. One relative died in Acre Prison in the 1940s. One sank in the Dakar submarine in the 1960s. Haim’s brother, Benny, died during the Yom Kippur War, before his brother’s namesake, Benny, fell in 2000. Still, Haim remains patriotic, understanding that such anguished heroism protected millions. Haim honoured me with the opportunity to speak. I told the troops they were the modern Maccabees. I said the Jewish people – and good people worldwide – understand that they represented the forces of freedom in a larger struggle against terror. The soldiers’ calm, mature, professional and high-spirited demeanours impressed us. This was not a war of anger and chaos, but of necessity and discipline. No one rejoiced in the civilian casualties – and many spoke of trying hard to minimize civilians’ suffering. The soldiers noticed, of course, that Israel always targeted terrorists, and occasionally missed. Hamas always targeted civilians. All wars are ugly, but if there is such a thing as a healing war, a war of correcting past mistakes, this was such a war. All wars are brutal, but if there is such a thing as a moral war, Israel tried to fight within ethical limits. Soldiers joked about the new phenomenon of a “misgrad” – a misgad, a mosque, harbouring Grad missiles, but they detested this kind of blurry urban combat. Still, the soldiers understood that “ein breira,” we have no choice. They all hoped that this time, they could finish the job. And they desperately wanted to free Gilad Schalit, the kidnapped soldier whose family has endured the kind of hellish purgatory the Avrahams know all too well, for nearly three years. 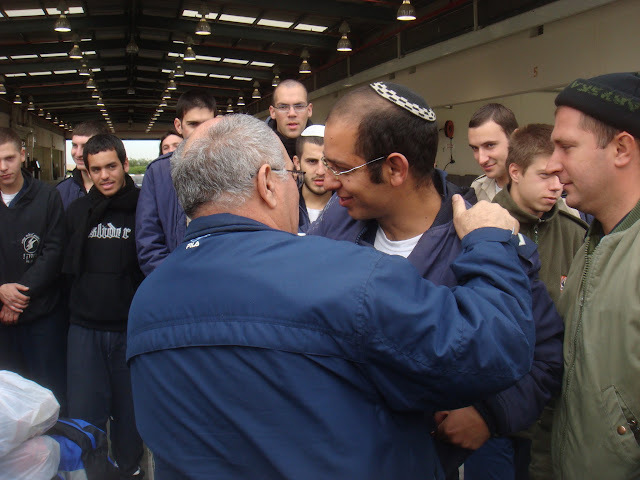 At the naval base, a young officer thanked Haim for coming. She said her brother’s death in combat when he was 18 broke her parents. She admired Haim’s ability to function, let alone to move forward, remain positive and retain his idealism. Every time her mother hears of another casualty, she bleakly welcomes the grieving parents into her enveloping black hole. The Avrahams – like the whole family of Israel – have experienced that black hole’s horrors. But the Avrahams show us that life continues – and we should appreciate the heroism and devastating sacrifices of the few that keep so many of us safe and free. 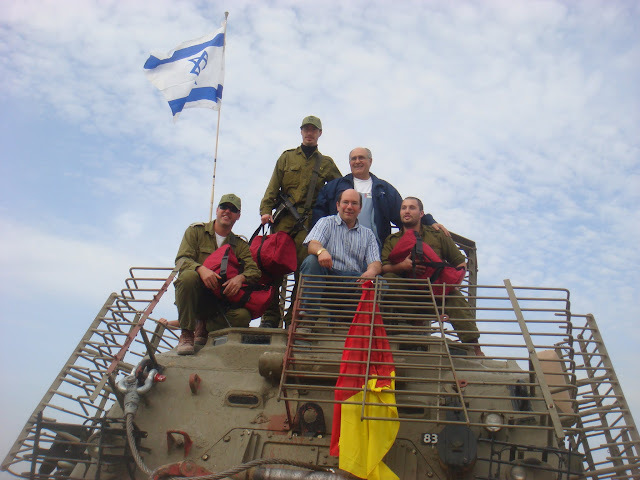 One soldier, absorbing all the love, support and generosity that was raining down on him and his comrades, from the homefront and from abroad, exclaimed: “Tiroo ezeh am yesh lanu” – look at how special the Jewish people are. After the Second Lebanon War, one former tank commander sighed, “when my kids were teenagers and stumbled, I reassured them that, fortunately, the lessons learned outweighed the damage done: so too with Israel’s army.” Two and a half years later, forced to confront Hamas’s rocket barrages targeting Israeli civilians, Israel fulfilled this prophecy. Great democracies like Israel can transform citizens’ grumblings into constructive self-criticism, turning officials’ failures into redemptive improvements. Ironically, while applying many lessons learned, this war illustrated the Lebanon War’s success. Hizbullah’s inaction as Israel pummeled another Iranian proxy, Hamas, suggests Israel’s message of deterrence worked. Still, despite this gain, the civilian Winograd commission and numerous internal IDF reviews proposed clever solutions to the logistical and strategic problems that plagued the battlefront and the homefront. This time, with Hamas’s Grad missiles reaching Beersheva, “the entire country is the front line,” one radio announcer proclaimed. Still, the municipal and national governments kept citizens informed and calm, responding quickly to emergencies. In 2006, individual citizens and flamboyant tycoons compensated for bureaucratic incompetence; in 2009, the bureaucrats were the heroes. More surprising, Israel’s governing trinity – Prime Minister Ehud Olmert, Defense Minister Ehud Barak and Foreign Minister Tzippi Livni – avoided the Lebanon War’s bragging and mission creep. This self-discipline reverberated down the chain of command. Chief of Staff Gabi Ashkenazi was the war’s Greta Garbo, often seen rarely heard. And this time, officers collected soldiers’ cell phones to thwart electronic eavesdropping or loose lips. The military learned to be as nimble as the terrorists. In 2006 Hizbullah easily ambushed regularly scheduled supply convoys lumbering along the three border crossings into Lebanon. This time, units entered and exited Gaza via multiple routes at random times, frequently picked out of a hat, so no one knew the next move. This time, like last time, the entire army tried minimizing civilian casualties. Soldiers – especially pilots – occasionally aborted operations, missing targets to avoid killing unnecessarily. As the world’s self-righteous arbiters of morality protested – usually marching with crass anti-Semitic slogans – Israel’s soldiers struggled to balance strategy with morality while fighting an enemy that hides behind its own civilians. Soldiers coined a new word “misgrad,” linking the Hebrew for mosque, misgad, with the Grad missiles stored in too many Islamic houses of worship. This soldier had just spent nearly two weeks in a tank. When encouraged, he described the cramped conditions, how cold the box of metal gets at night, the attempts to laugh at humiliating hygienic conditions. Apparently, one pair of underwear can last eight days. After two days you reverse it. Two days later turn the underwear inside out. Two days later, reverse again. While Israel’s finest young people are forced to harden themselves amid the war’s blood, sweat, smoke, smells, fear and brutality, wars bring out a soft side in Israel’s body politic. The radio plays sappy songs, about – as one hit goes – the desire to embrace every soldier, from the Chief of Staff to the rawest recruit. 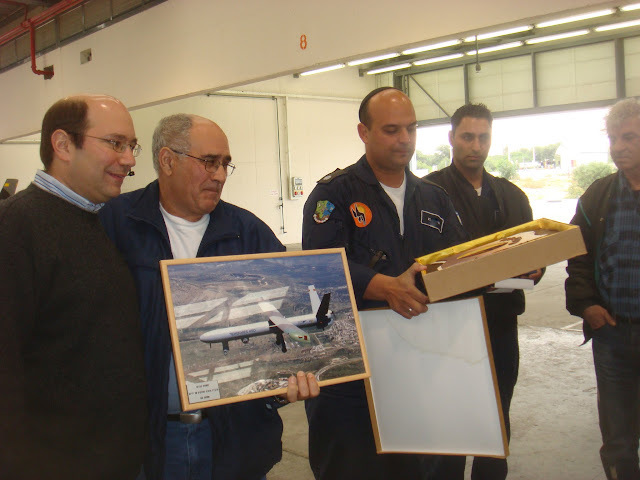 Talk shows broadcast heartbreaking letters from teary mothers and fathers to their fighting “Dudus” and “Mickeys.” People like Haim Avraham, whose son Benny was kidnapped then killed by Hizbullah in 2000, visit the troops, hugging them and delivering supplies of candy bars, long johns, and, mercifully, clean underwear. Perhaps the best perspective on the war could be found in Beersheba’s Soroka Hospital, where the homefront and the battlefront meet. Despite occasional “Tzeva Adom,” “red alert” sirens, the staffers worked resolutely, calmly, heroically. Many still can’t forget the heartbreaking new mothers’ shuffle, when the bombing began, leaving the maternity ward for a safer area. The pictures of Jewish, Beduin, Druse, and Muslim Israelis dressed in pajamas, some rolling their newborns in carts, others dragging IV monitors, illustrated just who Hamas targets – as did the hospital’s need to put sandbags over its sleep lab. Just outside the hospital, by its helipads, a line of stretchers stood, waiting to be filled with the day’s casualties, the whiteness of the sheets soon to be stained by the blood of young kids who would rather surf the net than fight this tragic but justified war. At one briefing for a North American rabbinic solidarity mission, one rabbi asked: “Do the Palestinian casualties from Gaza arrive here, too?” The administrator answered, “No longer. This is now for soldiers and for locals. Gazans go to other Israeli hospitals.” Here is Israel’s democratic dilemma, in all its messy grandeur. A democracy that sustains 10,000 rocket hits – especially after withdrawing from an area whose people could have then pursued peace – must defend itself. But both the rabbi and the doctor assumed – correctly — that Israel would nevertheless act as moral as possible in hellish circumstances. And here, too, is the secret to Israel’s success. Along with the democratic capacity to improve, it has the democratic conscience to protect its own citizens while trying to minimize the enemy’s civilian casualties too. My family and I returned from England on January 2, midway through the second year of our extended Israel adventure. The seventh day of war against Hamas’s rockets added frissons of anxiety to the usual arrival chaos. After an impromptu security check as we deplaned, guards detained one passenger. It was a fair question. We were returning from Limmud – a festival of Jewish learning with 900 sessions for 2,000 participants in five days at a bucolic (if freezing) English campus. In that British bubble, or our usual Canadian cocoon, we never worried about suspicious objects or avoided riding on buses. Of course, the answer goes deeper. We are here because the Jewish people have only one homeland, only one Jewish place running on Jewish time, where we belong as a people and are not living by anyone else’s good graces. There is nothing like Jerusalem on a Shabbat, on Sukkot, on Yom Kippur. The tranquility, spirituality, community and history enveloping us and enriching our lives here are unique. We are here because daily life here is also special. Kids roam comfortably, under neighbors’ watchful, even prying, eyes, as adults build this small, still fledgling state, with such potential, and yes, much room for improvement. Many of those Israeli traits that Westerners dislike, the pushiness, the incessant improvisations, are the very characteristics that will help win this war and make this experiment work. We are here because we, like Jerusalem’s many “meaning junkies,” as one friend calls them, seeking more to life than the latest pop culture trends, hoping to root our lives in enduring values. We are here because when we wander around Jerusalem’s Old City or delight in Tel Aviv’s modernity, when we remove ancient pots from the ground or buy modern artistic knickknacks, we do it with the heroes of Jewish history sitting proudly on our shoulders: Deborah the prophetess or David the king, Sarah Aaronsohn the Nili spy or Menachem Begin the fighter turned peacemaker, Golda Meir the prime minister who also left America’s comforts or David Ben-Gurion, the prime minister who knew when to compromise in accepting the UN partition plan and when to plunge ahead in declaring the state despite American and Jewish calls to wait. We are here because our great-grandparents dreamed of being here but could not be, because one grandfather fought in the 1948 War of Independence, and another helped smuggle weapons from New York so Israel could be free. For generations Jews have been singing “Next Year in Jerusalem.” This is our time to be in Jerusalem, build Jerusalem and be rebuilt by Jerusalem, not sing about it as if it were some impossible dream. We are here because the fight against terror knows no boundaries; this month it is Sderot and our cousins’ kibbutz in the Negev, last month it was Mumbai; seven years ago on 9/11 it was my hometown, New York. But here Jews control their own fate, unlike the Lubavitchers in Mumbai who had to wait for the Indian army to get organized, unlike in Montreal where we have to beg to designate firebombing a Jewish day school a hate crime, only to see the perpetrators punished lightly. We are here because – as I said at the airport – good people cannot flee but must fight evil. Even critics condemning Israel’s supposedly “disproportionate response” implicitly concede that a state is justified in responding to 10,000 rockets terrorizing its citizens over eight years. And I for one, am proud of Israel’s response – only after years of exhausting diplomatic efforts, only after offering the Palestinians a chance to build Gaza by removing the constant struggle with the settlers and the army, only after naive but well-meaning American Jewish philanthropists raised $14 million to donate the burgeoning hothouses the Israelis developed, inviting Palestinians to make Gaza productive rather than a terror center – which Palestinians then trashed. I am proud of Israel’s attempt to minimize civilian casualties even as Hamas terrorists cower behind women and children, behind mosques, hospitals and UN schools. We are here because if we flee, who are we; if we let others fight for us, what are we; and if none of us fight, where will we – and the world – be? What values would we stand for if we abandoned Jerusalem, as cousin Daniel continues farming on the Gaza border with rockets flying overhead, as our friend Mickey and thousands of others serve their country, the Jewish people and the civilized world so honorably and selflessly? Israel, the Jewish people’s national project, is a rich tapestry. Every day those of us in Israel, temporarily or permanently, add golden threads to this extraordinary old-new artwork. Some threads may be as short as the ones Birthright Israel participants add in their 10-day stints here, some may only last a year or two, others are lifelong. Others, tragically, are cut short – as we have seen too frequently in this war as well. This is our moment to spin our Israeli yarn, and add to this magical Jewish tapestry with as many golden cords as we can create for as long as we choose, on our timetable, not cowed by anyone’s threats. And yes, being here will sometimes test our fiber. But a good yarn also means a great story, and we are blessed to be here, now, weaving the tapestry of modern Israel – and helping to star in this grand narrative, one of the amazing adventures of 21st century modern democratic life. The writer is professor of history at McGill University and the author of Why I Am a Zionist: Israel, Jewish Identity and the Challenges of Today and Leading from the Center: Why Moderates Make the Best Presidents. HIGHLIGHT: It is significant that the most popular figure in the world today – whose middle name is Hussein – has endorsed Zionism so passionately. faithful from celebrating his historic ascent. and Martin Luther King on a poster; and “Thank You Jesus, We Never Would Have Made It Without You” on a T-shirt. One Moroccan immigrant kept saying, “Only in America, only in America,” as he watched the self-described skinny kid with a funny name become president amid such a worshipful crowd. Obama understands that the growing cult of personality surrounding him is a great asset, giving him a mandate to succeed. But he also knows that hope is like a balloon, if properly inflated it soars into the sky, dazzling, delighting and elevating, but if overblown, it pops. The frenzied hopes his election triggered could sour. Shrewdly, pragmatically, constructively, Obama wants to channel this energy into a badly needed sense of communal renewal. His campaign slogan was “Yes We Can,” not “Yes I Can.” He is continuing the initiative he began with his lyrical, extraordinary 2004 Democratic National Convention speech, trying to articulate a vision of liberal American nationalism that works for the 21st century. Obama’s repudiation in 2004 of the “red America” versus “blue America” division, his inaugural celebration of “our patchwork heritage” as a “strength not a weakness,” seeks to forge a new nationalist center that heals America’s wounds and revives a sense of community. As a liberal nationalist, appreciating liberal democracies’ great accomplishments, Obama has also championed Zionism eloquently. In an important, all-too- neglected interview with the Atlantic’s Jeffrey Goldberg during the campaign, Obama explained that he learned about Zionism from a Jewish camp counselor. As a rootless child searching for his own anchors, Obama identified with the Jewish yearning to return home after being uprooted, especially after the Holocaust. This heartfelt statement goes far beyond the usual politician’s campaign pieties. Sadly, few Jewish students – or their parents – these days could explain Zionism as powerfully or eloquently – wouldn’t it be great if we all tried to match him. OBAMA’S INAUGURATION, then, also gives the Jewish people a great and timely gift. Just as his message of liberal American nationalism should resonate even when he inevitably bogs down in the controversies of governing, his message affirming Zionism should be broadcast broadly, no matter what Middle East policies he pursues. Especially after the Gaza war, with Zionism and Israel again embattled, it is significant that the most popular figure in the world today – whose middle name is Hussein – has endorsed Zionism so passionately. We should use Obama words to repudiate the forces of darkness who try to transform Hamas terrorists into democratic freedom fighters while not only criticizing Israel’s actions but delegitimizing the state and Jewish nationalism. And during this hopeful moment, when the Obama presidency has only happy tomorrows ahead and no embarrassing yesterdays – yet – we should all join in hoping that this extraordinary politician can live up to the best of his rhetoric and the heady aspirations people are projecting on him, in the streets of Washington and throughout the world. Once again, in Israel’s hour of need, George W. Bush has supported the Jewish state eloquently, passionately, gracefully. At a time when most presidents use their rapidly shrinking bully pulpit to burnish their legacies, Bush devoted one of his final Saturday radio addresses to defending Israel’s actions and condemning Hamas. “This recent outburst of violence was instigated by Hamas, a Palestinian terrorist group supported by Iran and Syria that calls for Israel’s destruction,” Bush declared. He added that “Since Hamas’s violent takeover in the summer of 2007, living conditions have worsened for Palestinians in Gaza. By spending its resources on rocket launchers instead of roads and schools, Hamas has demonstrated that it has no intention of serving the Palestinian people.” George W. Bush has consistently used this kind of clear rhetoric to distinguish between Palestinians’ self-destructive addiction to terrorism and Israel’s justified self-defense. Instead, most Jews have taken Bush’s pro-Israel actions for granted – and joined the general public pile-on against him. Intelligent beings can hold competing positions, supporting some presidential positions and not others. The polarizing partisan Bushophobia which has characterized the last eight years, wherein people cannot say anything positive about the President is foolish and dangerous. Life – and particularly American politics – is too complex to approach issues so simplistically and fanatically. One can thank Bush for standing by Israel while disliking his tax policies or his war in Iraq. One can even thank Bush for standing by Israel at critical moments while criticizing his approach to Israeli-Palestinian negotiations. In fact, a heartfelt thank you from a longstanding liberal or Bush-critic can be even more resonant and appreciated than yet another round of praise from conservative fans. Thanking Bush publicly, collectively, flamboyantly for befriending Israel is particular important because American Jews are facing a growing gratitude gap with Republicans. Clearly, George W. Bush, John McCain, Evangelicals and millions of other Americans right and left support Israel because it is the right thing to do, not because it is the politick thing to do. The contempt of the world for the pro-Israel position, as well as the contempt of so many American Jews for Republicans and Evangelicals, suggests that there are easier paths to popularity and votes. Still, politics is a game of give and take. What Tom Wolfe calls “the favor bank” is significant. American Jews need to figure out how to thank Republicans and Evangelicals for supporting Israel, even if it does not translate into massive Republican votes. At the same time, American Jews should be more wary of the Democratic party’s role as the home for many of the most virulently anti-Israel forces in America today. American Jewish voting behavior powerfully disproves both the claims of dual loyalty and all the Israel Lobby stereotypes. The fact that three-quarters of the American Jewish community consistently votes Democratic proves that American Jews vote as Americans more than as Jews and are more concerned with a candidate’s domestic policies than foreign policies. Still, this lovely demonstration of American Jewish patriotism risks neutering the American Jewish community. A community that rewards its enemies and punishes its friends rapidly loses political clout.